Grace among the bedpans | When I Survey . 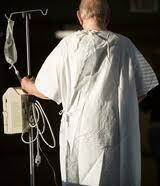 . .
Pastors spend a lot of time in hospitals. There they meet their congregants in trying moments, ill or hurt, facing or recovering from procedures that frighten and confuse. The most formidable lay pope, the one who thwarted your every dream at the last trustee’s meeting, now looks diminished in a “johnny” gown. Even in the best of hospitals the smell of mortality is ambient. Which is why hospitals are such fertile spaces for grace to make an appearance, and why ministers do well to be present there as often as they can. Most people get better and come back into the life and flow of the congregation, but they will not forget that in one of life’s delicate moments you were there, and through you, their congregation was there, and through you, by grace, God was there. Machines, are stroked, pummeled, impaled, and Oh! The morphine murmur under the lost sigh! Will need God to retrieve them as we fall. This entry was posted in Arnold Kenseth, Christian Ministry, Grace, Pastoral Ministry, pastors. Bookmark the permalink.